Join us for an evening of tasty food, signature cocktails, guest chef demos and music to raise funds for St. Joseph's Culinary Program. 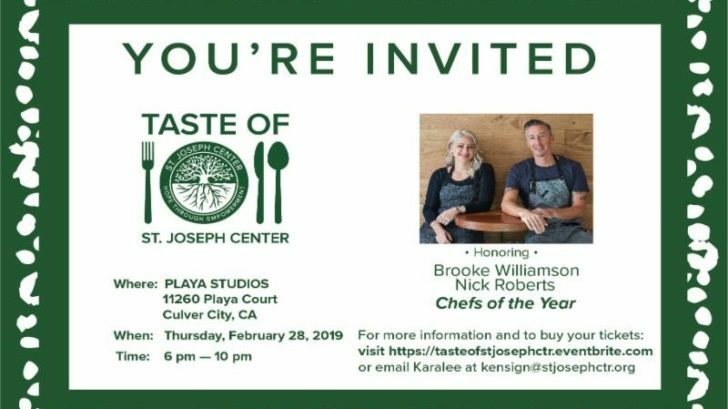 We will be honoring Chef Brooke Williamson and Chef Nick Roberts as Chefs of the Year for their outstanding service and dedication to our community. The married couple owns popular Westside eateries such as Hudson House, Playa Provisions, Da KikoKiko, The Tripel, and Small Batch Ice Cream. The duo will demo one of of their signature bites, as well as create a signature cocktail for the night. ALL PROCEEDS GO TO ST. JOSEPH CENTER'S CULINARY TRAINING PROGRAM! About St. Joseph Center's Culinary Training Program (CTP): This program enrolls low-income individuals to train them with cooking skills they can use to succeed in the food industry. A full session is 12 weeks with 8 weeks in traditional culinary school, followed by a 4 week/80 hour internship at some of the best restaurants in LA - i.e. Petit Trois, Ashland Hill, Bottega Louis, and Ritz Carlton.